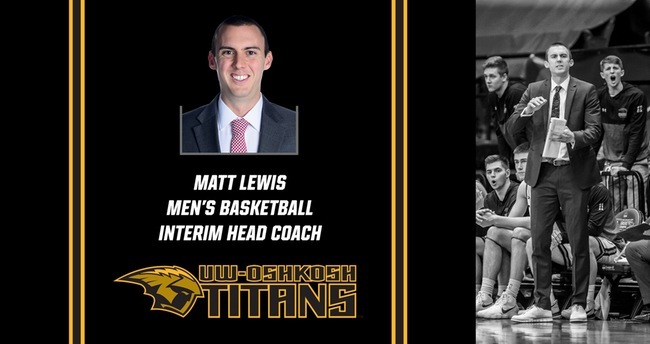 UW-Oshkosh has named Matt Lewis the Titans Interim Head Coach men’s basketball coach on Thursday. 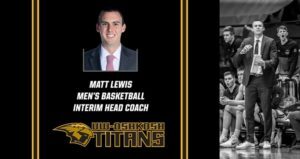 Lewis has been the Titans top assistant, coaching at the school for the last six years. He’ll lad the Titans for the 2018-’19 season while the University conducts a national search for Pat Juckem’s replacement. Juckem was named the new coach at Washington University in St. Louis. Assistant Chancellor and Director of Athletics Darryl Sims said they’ll form a committee of various members from the school, including students, to help find the fulltime successor. Sims didn’t rule out the possibility that Lewis could eventually land the spot in a fulltime basis. 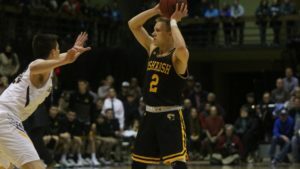 The UW-Oshkosh Titans advanced to the NCAA Division 3 men’s basketball final four for the first time in program history, knocking off Augustana 95-88 in overtime on Saturday. The Titans (24-7) were tied 76-76 after regulation and then won the overtime period 19-12. Former Kimberly standout Ben Boots led the Titans with a career-high 36 points, hitting 12 of 23 from the field. Teammate Brett Wittchow added 19 points and pulled down seven rebounds in the win. Oshkosh hit 17 of 35 (48.6%) from three-point range as a team and made 24 of 31 (77.4%) at the free throw line. The 17 made three-point baskets are tied for second most in school history. The Titans will face Ramapo in Friday’s semifinal game in Salem, Virginia. Springfield will face Nebraska Wesleyan in the other semifinal with the winners to meet the following day for the D-3 National Championship. Charlie Noone – Photo Courtesy of UW-Oshkosh Titan Athletics. The state of Wisconsin went into the NCAA Division 3 Sweet 16 with three teams remaining in the field on Friday night. One team, the Oshkosh Titans emerged as the field was reduced to eight teams heading into tonight’s Sectional Finals. The Titans (23-7) got 32 points from Charlie Noone to knock off Emory college 93-72. Oshkosh faces host Augustana at 7 p.m. tonight with the winner heading to the NCAA D-3 Final Four. Both Platteville and Stevens Point lost in Platteville last night. 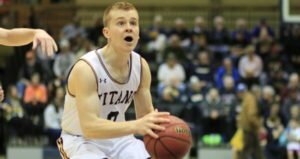 The host Pioneers fell to Nebraska-Wesleyan 79-78 as Nate Schimonitz hit a jumper with two seconds left to give the Prairie Wolves the last second win. Earlier in Platteville, Stevens Point fell to top-ranked Whitman College 65-55. Brett Kasper tossed six touchdown passes to lead the UW-Oshkosh Titans to a 42-21 win over North Central in the second round of the NCAA Division III playoffs on Saturday at Titan Stadium. The Titans fell behind 7-0, then scored 42 straight points before North Central would score again. Kasper finished 18 of 24 for 276 yards. Two of the touchdown passes went to Sam Mentkowski who finished with four receptions for 117 yards. The Titans (11-0) will face Wartburg (12-0) at Titan Stadium at noon on Saturday in the quarterfinals. Wartburg clobbered Trine 49-7 to advance. In today’s WRN Sports Daily, there’s trouble brewing in Oshkosh with the men’s baseball program. Long time head coach Tom Lechnir has been told his contract isn’t being renewed for next season. After 728 wins, he’s baffled at the move and is considering legal action against the school. The Brewers dropped their series finale to the Dodgers. I ask, why can’t Ron Roenicke be more like Don Mattingly? During Packers OTA’s, the offense has been running the pistol and read option. We’ll tell you why in this segment of the WRN Sports Daily.